DC Power in your data center, is now the time? In response to increasing pressure to maximize efficiency, more and more IT manufacturers, are recognizing the growing need for switches and routers that can accept AC or DC power. Traditional IT equipment has an AC power supply. And although it has been recognized for years that using DC is more efficient, the lack of equipment that accepts DC power has been a roadblock to adoption of DC power. DC power is more efficient because its use minimizes the number of conversions from AC to DC, reducing the amount of energy lost and therefore saving money. Most data center equipment uses DC power. Power coming into the data center is sent to the UPS system where the AC power is converted to DC power to maintain the batteries. Before leaving the UPS system, the DC power is converted back to AC power, which is then distributed to the equipment. Because electronic systems are native DC systems, the AC power must go through one last conversion to DC power in individual equipment power supplies. What is the bridge that will allow your data center to use more efficient DC power? Products like the GE CPS6000, GE OneStep Edge and Inverters are the answer. The GE CPS6000 is a highly configurable -48Vdc outside dc power plant in a compact system that is 2U high (3.50 in./ 89 mm) and mounts in either 19″ or 23″ wide frameworks. The CPS6000 offers a wide range of rectifiers from 10A to 50A with input voltages both in 120V and 208/240V nominal for worldwide applications. Power Solutions carries some models in-stock. The GE OneStep Edge Cabinet and GP 100 rectifier converts AC power to DC power with a battery backup. Essentially, the OneStep Edge converts 480VAC to 48VDC power distribution bus which is delivered to the equipment. With OneStep Edge the PDU is installed on the left side of the cabinet, leaving 42RU of space. And the layout of the cabinet reduces the cable needed. Power Solutions LLC offers a broad range of Inverters that offer high load capacity, tough housings and long service life. Offering the performance, design, and functionality that you require of your DC-to-AC power inverter, our user-replaceable capabilities and modular designs offer expandable power levels and the cleanest true sine wave available. As a vendor-neutral provider of AC (UPS), inverter systems and DC power systems, Power Solutions LLC is uniquely positioned to help you evaluate the suitability of DC power in your data center. 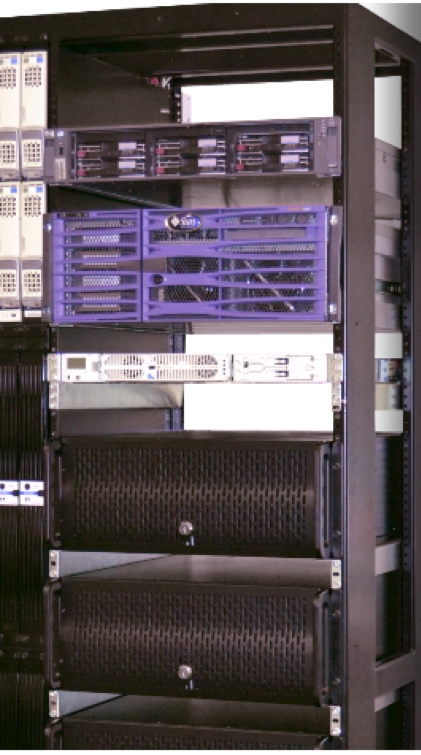 Whether you are considering a rack-based or row-based DC system, or simply looking to power a single -48VDC device within your data center, we can assist with engineering, furnishing and installation. Call us at 800-876-9373 or send us an email. call 800-87609373 or email sales@power-solutions.com.